We made our second visit to the stall after a year, it was a disappointment in our first visit and we think it is fair to check it out again since we are on the hunt for the best Hokkien mee in Singapore. Jason, the young man now taking over the helm of the stall from his dad had explained to us that it was not him but a helper did the frying on the day of our visit. We agreed with him it was definitely not cooked by him and promised to come back one of the days to validate the Hokkien mee. So, this round, we ensure it was Jason tossing the noodles in front of the wok before we placed the order. The plate of noodles was delivered after a 30 minutes wait, it was a plate of a Hokkien mee quite different compared to our first visit. Though it was still a gooey and wet plate of noodle, however, taste wise was so much better with the nice seafood flavour and the enhancement by the lard and the stock. 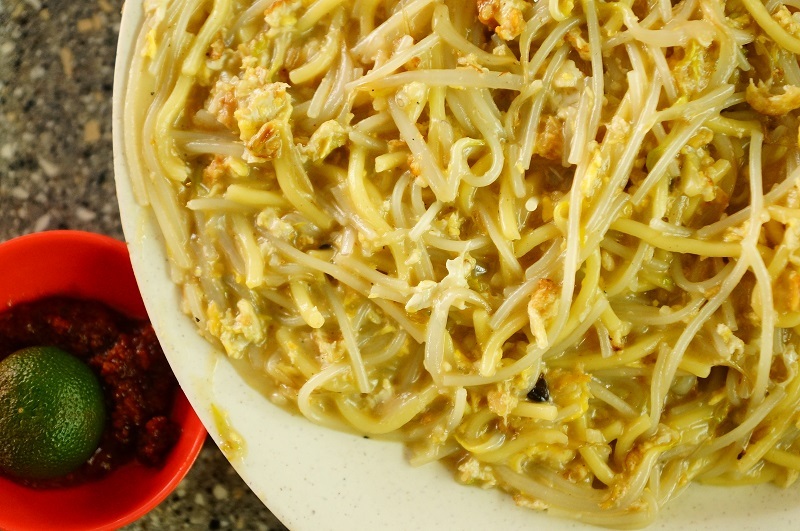 It is a good example how important a chef could make an impact to a plate of savory mee. Jason – the young man has proven it and we have no regret revisiting Tian Tian Lai. 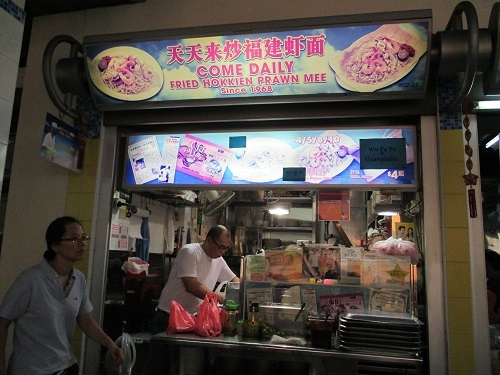 In fact, the taste is so much better that the stall has the potential to be shortlisted one of the best fried Hokkien mee in Singapore. Let’s see. 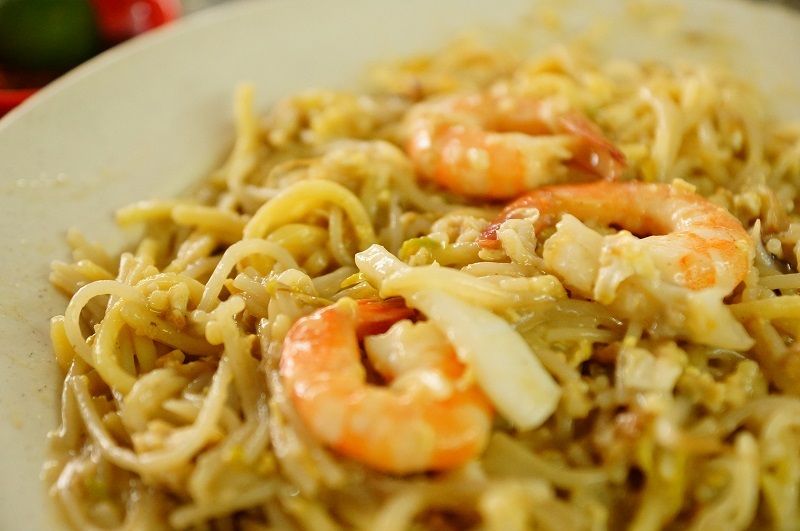 The Hokkien mee was a mixture of white and yellow noodles, fried with crustacean stock and enhanced with the sinfully but important sotong, shrimps, eggs, pork belly and the soul of the flavour – the pork lard. Everything that went into the noodles were cut in small strips like the sotong and pork belly which would allowed better blending of the flavour from the ingredients with the mee. The shrimps were small too and perhaps one of the smallest from all the Hokkien mee we have even eaten. The mee was quite moist and to the extent of looking rather soggy. The first few mouthful of the Hokkien mee made the four gluttons completely expressionless, as something seems to be missing from the Hokkien mee by this renowned stall. First of all, we can’t taste the much needed sweetness and flavour from the seafood stock in the mee, the plate of mee tasted like a bowl of plain rice. The plate of mee just lacks the emulsification that the crustacean stock and the seasoning lend to the mee. 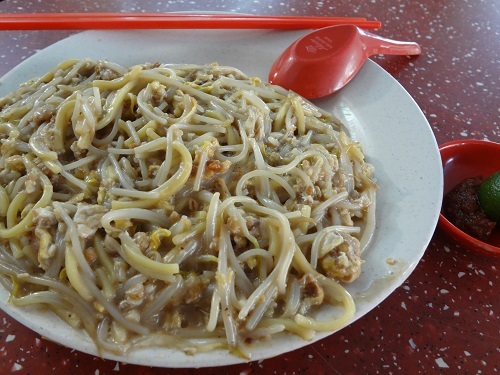 It was just too plain in the taste; lacking of the Hokkien mee’s aroma. There was also the lack of the wok charred (Wok Hei) smell as well. 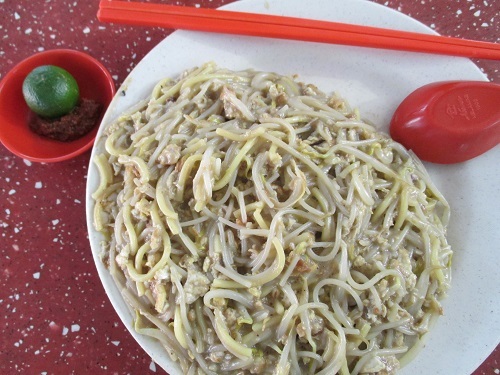 Overall, if this is the standard we expect from Tian Tian Lai Hokkien Mee, we will probably quite disappointed as we can’t really appreciate the goodness of the mee here as acclaimed by many of the food reviews. We hope the plate we ordered could be the exceptional and we were the only unlucky one of the day. We shall be back another day to validate the stall again and hope to change our perception. Hi . I’m Jason and I’m the son of tian tian lai hokkien mee . Sorry for the bad impression you got on us and I’m please to ask you for a return to try it again. Maybe that time the person cook was from me and I’m sorry for the bad impression you have. Come try it when my dad is back if possible because I’m still under training still. He will be back on next week or probably when other days you come. Do let me know if I’m the one who cook and you wanna try my dad skill as sometimes I’m the one who will be cooking. I hope we wun disappoint you. Jason, we are glad that Tian Tian Lai is able to accept our feedback. 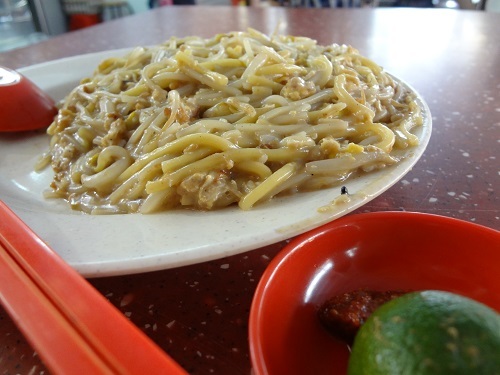 We will definitely be back one of the days to try out the hokkien mee again. However, we hope it is you to do the cooking instead of your dad. cos’ we have the confidence you can do as well as your dad or even better than him. Thanks for your support and I’ll try my best to get over him if possible . As I’m the 3rd generation and I don’t wish it will spoil on by my hand. Do let me know the comment after that . Thanks once agin and sorry for the disappointment.